This Construction Project Checklist is designed to help project managers, constructors, architects and engineers to plan, schedule and budget processes for a project. You can use this checklist to get an idea of managing typical projects. Create a design of the building you want to construct. Usually this work is assigned to a design group (team) which consists of professional construction designers, interior designers, surveyors, engineers and architects. Your design group will plan physical characteristics of the building and then integrate this information with other parts of your project. 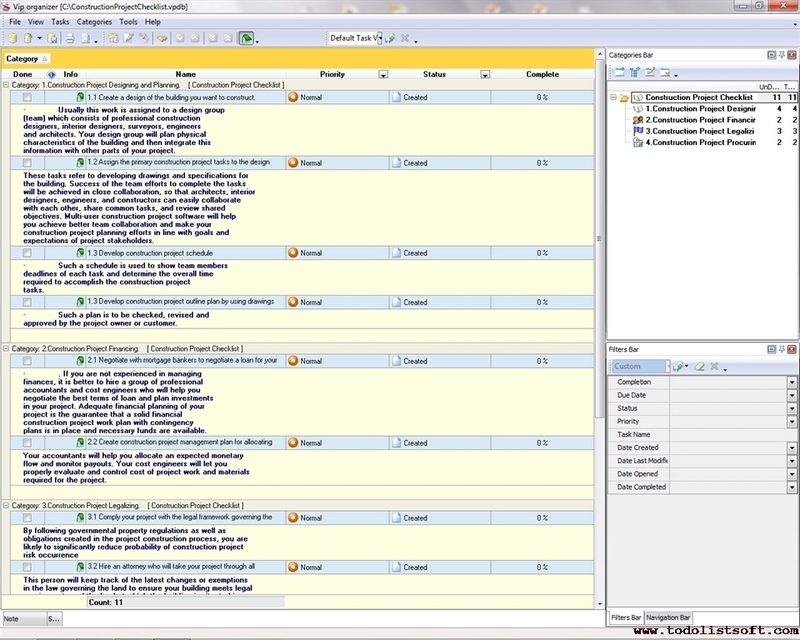 Assign the primary tasks to the design group. These tasks refer to developing drawings and specifications for the building. Success of the team efforts to complete the tasks will be achieved in close collaboration, so that architects, interior designers, engineers, and constructors can easily collaborate with each other, share common tasks, and review shared objectives. Multi-user software will help you achieve better team collaboration and make your planning efforts in line with goals and expectations of project stakeholders. Develop schedule. Such a schedule is used to show team members deadlines of each task and determine the overall time required to accomplish the tasks. Develop outline plan by using drawings and specifications and according to the construction schedule. Such a plan is to be checked, revised and approved by the project owner or customer. Negotiate with mortgage bankers to negotiate a loan for your project. If you are not experienced in managing finances, it is better to hire a group of professional accountants and cost engineers who will help you negotiate the best terms of loan and plan investments in your project. Adequate financial planning of your project is the guarantee that a solid financial work plan with contingency plans is in place and necessary funds are available. Create management plan for allocating and controlling finances of your project. Your accountants will help you allocate an expected monetary flow and monitor payouts. Your cost engineers will let you properly evaluate and control cost of project work and materials required for the project. Comply your project with the legal framework governing the property in your country. By following governmental property regulations as well as obligations created in the project construction process, you are likely to significantly reduce probability of risk occurrence. Hire an attorney who will take your project through all legislation requirements and make it legitimate. This person will keep track of the latest changes or exemptions in the law governing the land to ensure your building meets legal requirements and the land at which the building is situated is allotted in the right way. Manage organization of contracts. Your project is a set of contracts and legal obligations that require proper legal treatment and considerations. Poorly drafted and managed construction contracts lead to confusion and collapse, so your legal advisor should treat for your contracts and give you reports regularly. Project procurement describes activities to obtain construction materials required for setting up your building. There is one basic method of project construction procurement "Designing-Bidding-Building" which is briefly described below. The method of Designing-Bidding-Building. A traditional scheme of managing procurement refers to undertaking three processes: Designing, Bidding and Building. Designing is the process of developing a detailed project plan that includes WBS structure, exact timeframes, timelines, and required finances. Bidding is the process of negotiating with potential procurers and vendors to get the best bids. Building is the process of executing your project plan and constructing the building. The method assumes carrying out all the processes cohesively, step by step, one by one.